UNBELIEVABLE! 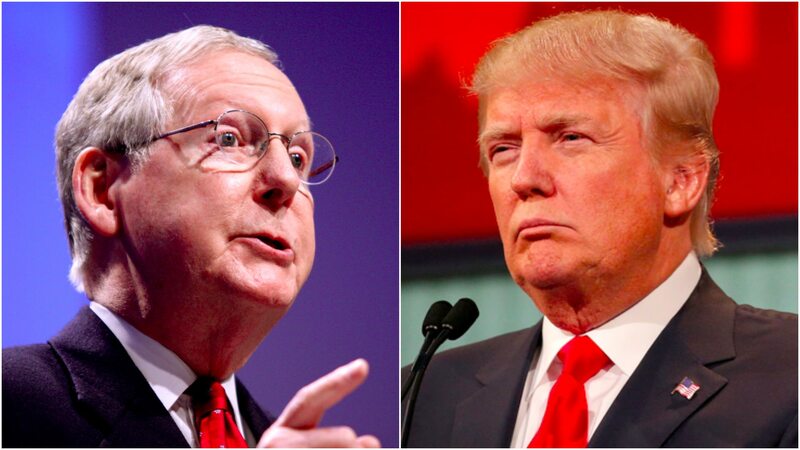 => Mitch McConnell Rips POTUS TRUMP Over His "Excessive Expectations"
Senate Majority Leader Mitch McConnell told a group of voters at a Kentucky Rotary Club gathering that President Trump’s “excessive expectations” are harming Congress’ ability to salvage its awful reputation and get things done. McConnell vented about the President’s political inexperience, complaining Trump’s focus on short timelines don’t reflect what Congress can actually accomplish. Speaking at a Rotary Club gathering in Kentucky on Monday, Senate Majority Leader Mitch McConnell vented about how President Donald Trump’s lack of political experience has led to him setting “excessive expectations” for legislative priorities. McConnell, R-Ky., told the group in Florence that he found it “extremely irritating” that Congress has earned the reputation of not accomplishing anything. “Part of the reason I think that the storyline is that we haven’t done much is because, in part, the president and others have set these early timelines about things need to be done by a certain point,” said McConnell, a Republican and the state’s senior senator. Trump, a political newcomer, as McConnell noted, has a habit of declaring progress on major priorities that do not necessarily reflect the reality of lawmaking. For example, as the House was in the midst of negotiations about its Obamacare replacement bill in February, Trump announced that Congress was in the “final stages” of its bill and said it would be ready for “submitting” in March. While the House bill was unveiled in March, that chamber didn’t vote on it until May, and health care votes continued until the end of July. That sort of disconnect has led to Trump’s expressing disappointment when bills — chief among them health care reform — fail to end up on his desk, even though, as with health care, the political reality indicated all along how difficult it was going to be to pass legislation. Rep. Brooks joined CNN’s Chris Cuomo to blast McConnell, calling on him to step down after failing to repeal Obamacare. Rep. Mo Brooks (R-Ala.) is renewing his call for Senate Majority Leader Mitch McConnell (R-Kent.) to step down from his leadership role after the chamber rejected a scaled-back version of a GOP bill to repeal parts of ObamaCare. To be sure, it’s not the first time Brooks, who’s running for the Senate seat previously held by Attorney General Jeff Sessions and currently occupied by Sen. Luther Strange (R-Ala.), has called for McConnell to step down from his leadership role. He also raised the idea on Wednesday during a policy breakfast at the conservative Heritage Foundation, where he called McConnell the “head of the swamp.” The majority leader is supporting Strange’s Senate bid.